The AOA Startup Grant 2017 application deadline is almost here! So don't wait any longer! 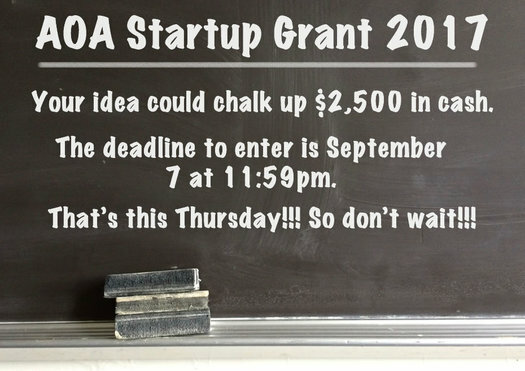 THE DEADLINE TO APPLY FOR THIS YEAR'S AOA STARTUP GRANT IS THIS THURSDAY NIGHT (SEPTEMBER 7) AT 11:59 PM. We repeat: THE DEADLINE TO APPLY FOR THIS YEAR'S AOA STARTUP GRANT IS THIS THURSDAY NIGHT (SEPTEMBER 7) AT 11:59 PM. Wait. No. Longer. Your project could win $2,500 in cash. Here are all the details about how to apply. We already have a handful of entries posted. Go have a look. Entries are posted in the order they're received, so it's worth getting in your app ahead of the deadline. The earlier it shows up here, the earlier it gets posted on the site, and the higher it appears in the listing. Those all might provide a little boost in the crowd voting. Speaking of crowd voting... it starts September 11. Get ready.